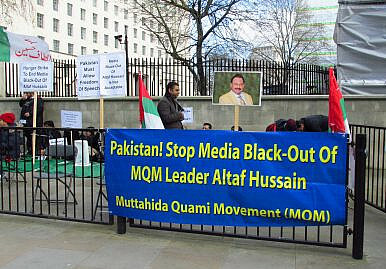 A pro-MQM protest in London. By sidelining Karachi’s genuine leadership, the military is only sliding the city into a novel security and political vacuum. On Saturday, reports emerged that the Pakistani security agencies, in their renewed crackdown against the Muttahida Qaumi Movement (MQM) in Karachi, sealed the party’s 200 regional offices, including its headquarters (known as Nine Zero). The latest security crackdown comes in the wake of party chief Altaf Hussain’s recent anti-state remarks, which allegedly incited the party workers into attacking media houses in Karachi. Generally, the MQM has established a reputation for itself as a party prone to resorting to violence and intimidation to achieve its political goals. The party has borne the brunt of the military’s counter-terrorism operations in Karachi for allegedly indulging in militant and terrorist activities against its political adversaries. The party’s militant wing has been blamed for carrying out large-scale political assassinations and collecting bhatta or “forced taxes” from Karachi’s merchant community. However, admittedly, the party’s leadership has mastered the art of survival: Hussain’s latest criticism of the military was denounced by the party’s Karachi-based leadership. The move appears to be a tactical maneuver to minimize the fallout that had emerged in the form of the military’s new crackdown against the party’s organizational structure. Although the state-led efforts to dismantle the MQM’s hold in Karachi have continued since its formation, the party’s existence is the result of the military’s backing of the organization’s chief in the early 1980s. The execution of the Pakistan People Party’s (PPP) founder Zulfikar Ali Bhutto in 1979 by the government of General Zia ul-haq paved the way for the 1983 Movement for the Restoration of Democracy (MRD) in which the role of Sindhi politicians was significant. Zia reportedly provided necessary political and financial muscle to make Hussain’s meteoric rise in Sindh’s politics a success story. After the 1992 military operation against MQM in Karachi, the chief of the party, Altaf Hussain, was forced to flee to London, where he has lived in self-exile since then. For more than two decades, Hussain has controlled the party’s affairs from his London hideout. The military’s consistent efforts to divide the party from within have always resulted in more support for the party from Mohajirs, refugees who settled in Karachi and the surrounding districts at the time of partition. During the 1992 military operation in Karachi, the military is known to have patronized a number of MQM’s dissident lawmakers to weaken the party: the MQM (Haqiqi) faction was the result of the split in the party that occurred in the early 1990s. The latest split has come in the form of Pak Sarzameen Party (PSP), which was formed earlier this year by MQM’s former Karachi Mayor, Mustafa Kamal. Despite publicly brandishing the organization as a movement openly involved in anti-state activities, the military has failed in breaking the party’s vote bank. The party stood as an undisputed winner in the last year’s local government elections in Sindh’s urban areas while it also came out on top in this year’s by-elections in Karachi. The reason behind this solid support for the party’s leadership is simple: the military’s so called counterterrorism operation in Karachi has only deepened the persecution of Mohajir community, which the party’s leadership has successfully been able to appeal to in order to maintain its political support base. Moreover, while the country’s civilian leadership mainly hails from Punjab province and likes to talk about how Karachi is the financial hub of Pakistan, it has never sincerely shared the concerns of Karachiites or paid heed to the city’s diverse ethnic mix, particularly the Mohajirs. Bulldozing the party’s offices and banning it from the national media will not alleviate the concerns of Mohajir community, whose growing isolation from the state is the direct result of the military’s series of crackdowns against the MQM’s leadership and workers alike; rather, such actions will further strengthen the party’s narrative of marginalization and victimhood. Above all, quick fixes will not resolve the issue of Karachi’s security. The city’s genuine political leadership should be allowed to work unhindered, for any further securitization of Pakistan’s largest city will only push it into an uncertain political and security vacuum. Karachi's politics are a mess, thanks to outside interference by Pakistan's security establishment and elites.